Brennan Industries and your company have a relationship that may be impacted by changes to California Proposition 65. We strongly recommend that you read this information and take appropriate action as needed to protect your organization, your partners, and your customers from potential legal action. California’s law Proposition 65 requires companies to inform California residents of toxic chemicals in products supplied that may cause cancer, birth defects, or other harm. Brennan’s fittings contain very low levels of some of the chemicals that are covered by Proposition 65. Brennan is aware that we may be exposing individuals living in California to one or more of the defined chemicals. 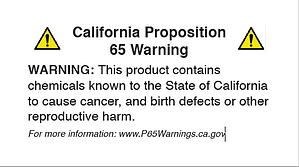 Therefore, all boxes shipped from a Brennan facility are affixed with a Proposition 65 label (see above) to make recipients of our product aware of same. Your company is responsible for notifying the end user that is, or could be located in California about this Brennan product warning. This includes labeling product that has been removed from the original Brennan box that was received with the Proposition 65 label adhered to it. Thank you for your support as well as for your understanding of, and adherence to Prop 65. 5 Types of Superalloys Our Calgary Location Is Moving and Expanding!